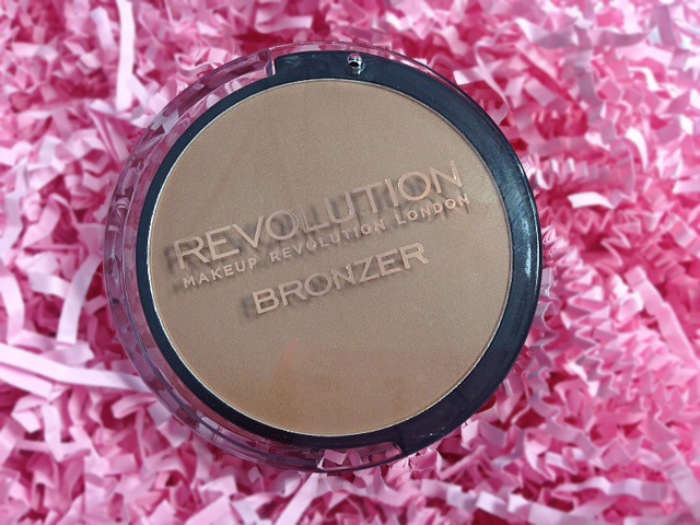 Makeup Revolution Medium Matte Bronzer! You may have seen from my two previous posts Makeup Revolution Ultra 32 Shade Eyeshadow Palette in FLAWLESS and Makeup Look and that I was sent some products to try from Makeup Revolution. The only product that I actually requested was this, the Makeup Revolution Medium Matte Bronzer* The reason I requested this was because I love a matte bronzer to contour with, long gone are the days where I use a big powder brush to buff in a shimmery bronzer.. all over my face yes I was guilty of going a little heavy with the shimmer bronzers back in the day. Now I simply use a matte bronzer to carve out my check bones (I have a football shaped head) and also dust some onto my temples. This is much more flattering, it actually gives my face some shape and dimension and also prevents me from looking like a orange mess. Now don't get me wrong, I like to bronze up my pale skin, I've never embraced being pale and doubt I ever will, but now I apply bronzer in a much more flattering way. Firstly I love the packaging. The compact is different to any other compacts I've seen. Instead of lifting the lid off, you just pull it and the bronzer slides out, all whilst remaining connected to the lid (is this making sense?) Underneath the bronzer is a sponge. I'm going to be totally honest here... I'm not sure why anyone would need a sponge to apply their bronzer though, so to me this isn't needed. 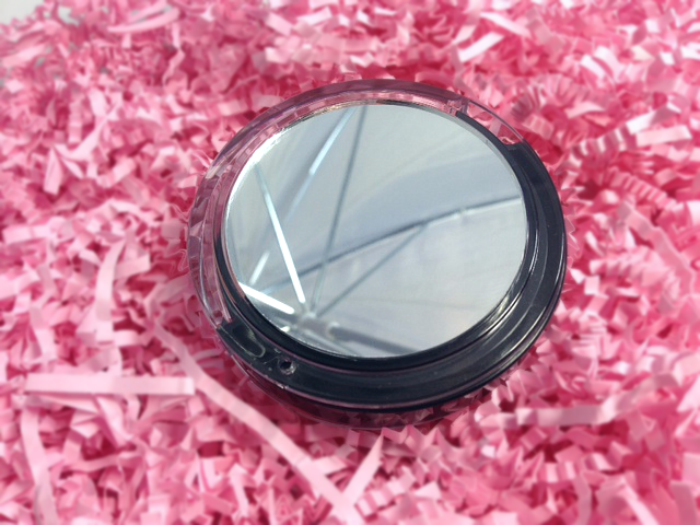 When you turn the compact over and peel off the ingredients sticker there you have a full sized mirror, which is just fab for when you're out on the go. I think that's a fabulous little touch to the packaging. The picture above is obviously swatched with my finger, so don't worry this won't come out like this on your face when used with a brush! 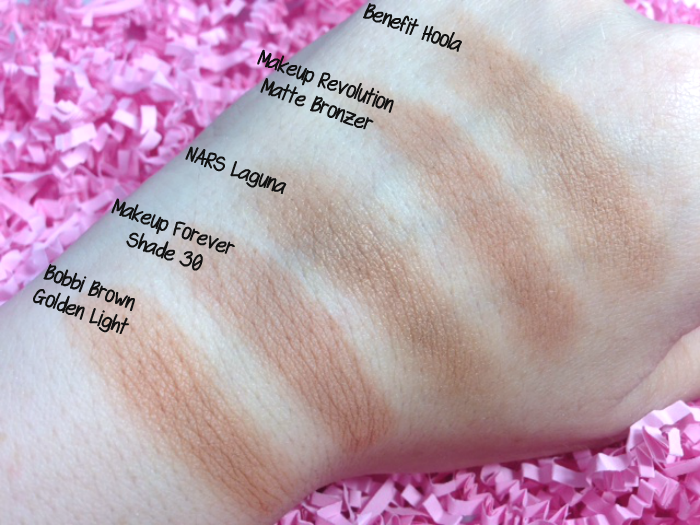 The quality of the medium matte bronzer is amazing for the price. It's not too chalky, not too orange or too brown. I'd say this is the ideal colour to use when contouring. 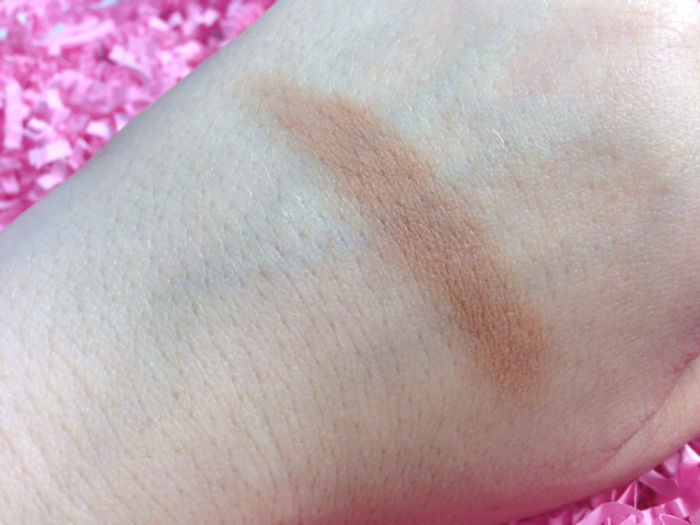 Also this is the exact colour I tend to look for when I'm out swatching new bronzers in the shops. It applies really well and the staying power is the same as all of my other high-end bronzers. I love that this is totally matte. Most call their self matte, but always tend to have a slight shimmer or glitter to it. I do own a lot of bronzers BUT mainly I use high-end matte bronzers as they tend to be less chalky, not too dark, yet build-able and tend to be completely matte. So of course I was keen to see how this £2 matte bronzer competed with my high-end bronzers. I posted the above picture (without the names) on Twitter, Instagram and Facebook and only one person could guess what one wasn't high-end, everyone else said something different! I chose these brands as they are well known for being the best matte bronzers on the market, also they are my favourite bronzers too. Side by side you can not tell which one costs £2.00 and what one costs over £20, actually most cost nearly £30! 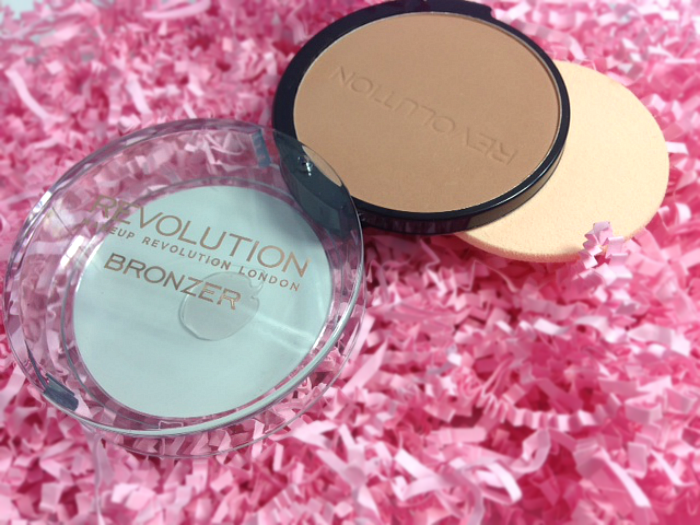 Colour and texture wise the Makeup Revolution Bronzer is most similar to the Makeup Forever Mat Bronzer, which costs £28!